AD guest post on the return of Shangri-La, Mary Weiss, by fellow Los Angeles blogger, Be The Boy. Recently the Onion AV Club featured a favorite record of mine, Reigning Sound’s Time Bomb High School, as part of their Permanent Record Collection. Reigning Sound is led by Greg Cartwright, Memphis garage rock legend from bands like the Oblivions, The Compulsive Gamblers and even a stint with ’68 Comeback. While it’s been a few years since a proper Reigning Sound record, they do currently appear as the backing band on the newly released record by Mary Weiss. Who is Mary Weiss you ask? Well you know her well, you just don’t realize it; Mary was the lead singer of the Shangri-Las who sang “Leader of the Pack” and “Give Him A Great Big Kiss”. Now watch how this all connects…. 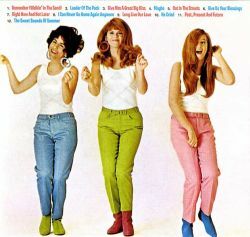 The Shangri-Las were produced by Shadow Morton, who also produced the second NY Dolls LP. The Dolls and later the solo Johnny Thunders frequently played “Great Big Kiss” live. For her comeback album, Dangerous Game, Mary Weiss is backed by Reigning Sound which makes her record sound something like early NY Dolls recordings with a slightly more delicate singer (very slightly) and a more soul. 40 years after “Leader of the Pack,” Mary Weiss sounds amazing and I couldn’t think of a better backing band for her than Reigning Sound. + Download Dangerous Game through eMusic’s 25 Free MP3 offer. + Visit The Hype Machine for additional Mary Weiss MP3s. Thanks for posting, I know this one has been out for a little bit but it’s been terribly under promoted. I only recently stumbled into it accidentally and I just can’t stop listening to it. Someone once said that if you stripped the guitar out, the Ramones would have been the Shangri-Las, well this record proves that you can have it both ways. Greg Cartwright wrote the bulk of the songs and he and Reigning Sound are pitch perfect behind Mary’s still breathtaking voice..